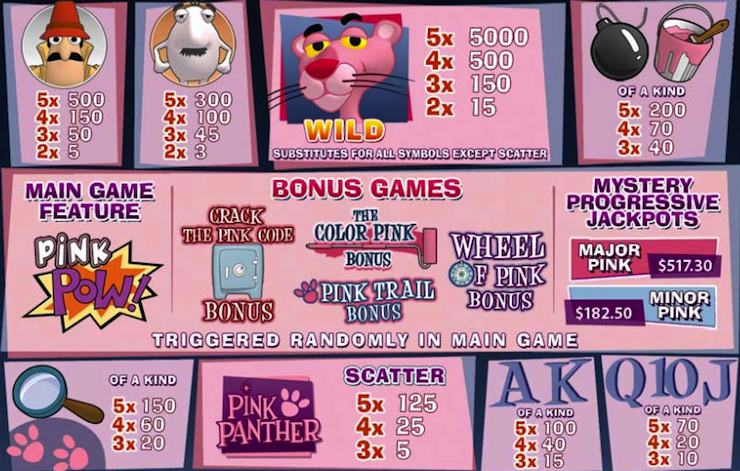 Pink Panther is a unique slot machine created by the world-known software expert Playtech. The word "unique" is not an exaggeration, and you`ll see why. Colorful, vivid graphics and memorable music make the Pink Panther slot one of the best Playtech products. It has 5 reels, 40 paylines, and 5 different bonus games - Pink Pow, Crack the Pink Code Bonus, The Color Pink Bonus, Wheel of Pink Bonus. In the Color Pink game the Pink Panther and the little man paint a wall of numbers in pink and blue, with only the pink numbers adding up as cash prizes. In the Pink Pow game the Pink Panther randomly blows up between 2 to 6 symbols on the reels turning them into wilds. In the Wheel of Pink bonus game the wheel of fortune offers an outer wheel spin which can win you cash prizes. There`re also 2 progressive jackpots (Minor Pink and Major Pink) − a great way to earn cash through exciting and amazing experience! Make sure it`s true by playing free slots at our site with no registration needed.